I am convinced that all good things experience a Golden Age. Whether it is a movement in art, literature, or music, or simply a popular activity, there is a period of time that might extend from a few months to many years, in which a cultural phenomenon first appears, and subsequently, grows in popularity. That glorious moment when a minor fad or major trend takes center stage, we refer to as its “Golden Age.” And once that exquisite moment ends, the world is unlikely to see the likes of it again. Looking back on my long life, and reminiscing, I give thanks for the many favors that destiny bestowed on me: a lovely wife and family, and more than my fair share of art ability, which enabled me to make a living painlessly. Beyond these all-important blessings, fate generously decreed that I would be there, at exactly the right time and place to, not only, participate, but, in fact, become a pioneer in the Golden Age of Collecting Comic Characters. From the moment that esoteric pastime began, shortly before the first flea market appeared in the USA, in 1968, and, throughout its glorious Golden Age, until the time, a dozen or so years ago, when its allure, for me, began to fade, I was there! Destiny had offered me, not merely a front row seat, but better still, a leading role upon the stage. 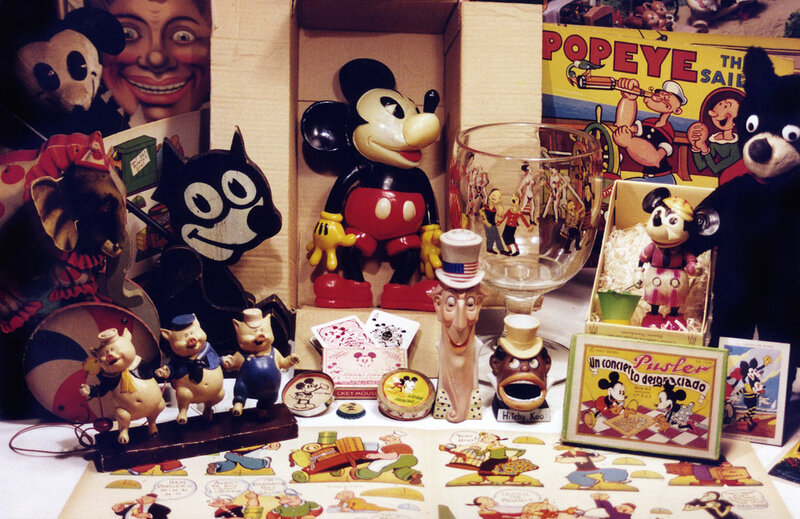 Shortly after the very first flea market in the USA, called, “Antiques in a Cow Pasture,” was created by Russell Carroll in Salisbury Connecticut in September 1968, flea markets began to crop up everywhere. 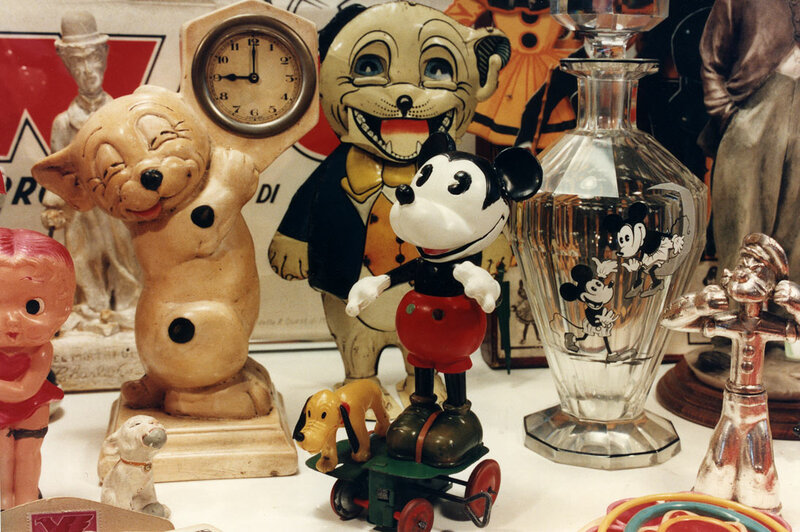 Eventually, there seemed to be an antique show, a toy show, or flea market somewhere every week. And I traveled to every one of these with my best buddy Noel Barrett. Noel is someone you might know, as he later achieved fame and acclaim, as the toy appraiser on the Antiques Road Show. The best flea market was Brimfield. Starting on a single field on a Saturday,( I was there for the first one and every one, thereafter, for the next thirty years) it expanded, with a new market, or two, or three, opening every day, along the single highway that ran through the tiny town of Brimfield Mass, for an entire week. This spectacular event took place three times a year, in May, July, and September. Noel and I drove there in tandem, and slept in our vehicles for five days. After ten years of this, Noel persuaded me that we should up our style, and share a room at the Sheridan, in nearby Sturbridge. When each Brimfield week was over, late on Friday afternoon, my tiny VW station wagon limped home, brimful of Brimfield treasure. I unloaded it and arranged the bounty on the desk beside me, where I could admire it for a week or so, as, piece by piece, I found the perfect place for each in my collection. In those days, my desk had two work stations. I used the one on the left for virtually everything, from inventing new toys to restoring old ones. Meanwhile, the righthand desk remained empty, except on these frequent occasions when it became the place where I would temporarily arrange the bounty from my latest hunting expedition. Sixteen years ago, I filled that space with a computer, and, for me, the Golden Age of Collecting Comic Characters was over. On some of these occasions, if there happened to be a film in my camera, I would casually click a photograph of the arrangement, for no particular reason. God knows, I never looked at these haphazard photos. In fact, no one but me has ever seen them. For years now, they have been mixed and scattered randomly, throughout the stacks of storage boxes that hide in plain sight, here, behind me. Therefore, the photos that I’m about to share with you have never been seen by anyone, but me. They chronical what it was really like to be yours truly, and gather treasure by the carload, from every major flea market and show on the East Coast. I was not only at every Brimfield, beginning with the first one, but the same is true for every Atlantic City Show, from the first to to the last one. I also attended every Kennedy International Toy Show, and every Renningers Extravaganza. I never missed a single one. The Allentown Toy Show? Yes, I was also at all of those, and many an odd flea market, or local show that took place in-between. And when there was a weekend free, one could always find me and the family at the Stormville Flea market, an enormous outdoor show that, early on, had many antiques. I wallowed in this delicious state of Bliss for over thirty years. The photographs that you are seeing are the result of a day’s worth of rummaging through the boxes stacked behind me, and one more day of scanning. Somewhere in the storage area under the floor, there are many more photos like these. Furthermore, there was many a haul that escaped being photographed at all. 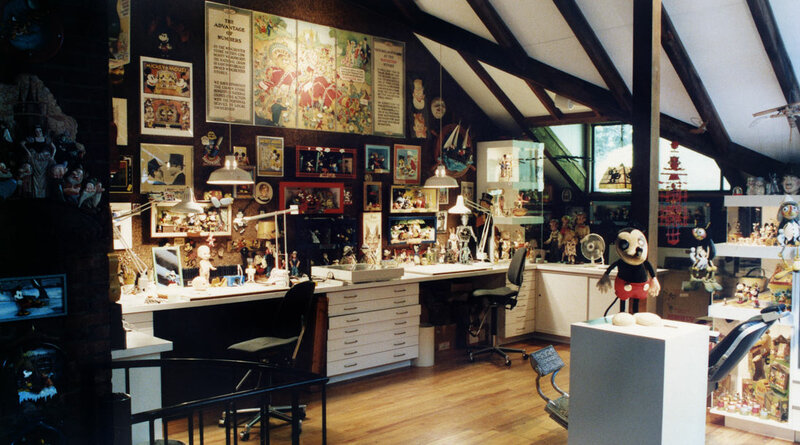 And, throughout a quarter century of collecting, my right hand desk was filled and emptied, no less than ten times a year. So simple math will indicate that the 35 photos that I scanned the other day only begin to tell the story of thirty years of collecting frenzy. I have made no attempt to arrange these photos in chronological order. Instead, they represent the order in which I found them, the day before yesterday. Some of these loads were gathered, throughout a week at Brimfield. Others, usually the biggest ones, represent four days at the Atlantic City Show. While still others were acquired at the International Toy Shows. In some cases, I can recognize an object that I remember getting, and therefore can identify which of the above events the photo represents. I remember this first load well. It was gathered at a memorable Atlantic City Show, and it is full of treasures and memories both. 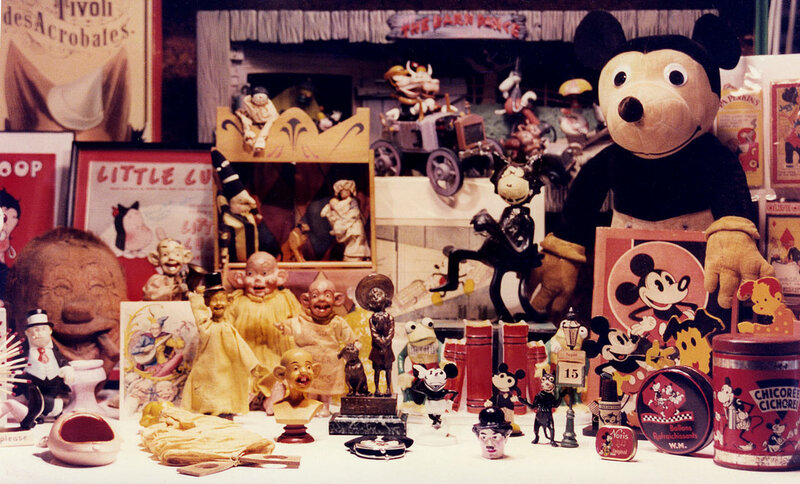 The photo is dominated by a very surreal poster, in which Mickey is transformed into an elephant. There are some major rarities and treasures here as well. I guess I was especially excited by this particular trove of treasures, because I also snapped some close ups. Stuart and Linda Cropper, my favorite English dealers, often stayed with us when they came to the USA. They later bought a house in the neighborhood. On this occasion, Stuart brought me this marvelous Bonzo clock. It remains one of my favorite images of Bonzo. Meanwhile, that amazing Bonzo windup toy was one of the secret treasures that Stuart’s friend and sometimes partner, John Haley, held for me. And worthy of a photo of its own is this spectacular Spanish wine jug. Perhaps, these are commonplace in Spain, for all I know. But I do know that it is the only one that I have ever seen or heard of in the USA. I found this by simply running around the show. It’s well over a foot tall. The liquid pours out of Mickey’s nose. In his left hand, he holds a violin. Attending a show or flea market was not unlike playing Monopoly to me. As I walked for miles and miles, up and down the endless aisles of Brimfield or Atlantic City, even though, I got in early, I believed that I was playing the game fairly, and working my way around the gameboard legitimately. Nonetheless, I always sensed that some benevolent power was looking after me, and dealing me all the best properties. Whenever there was a major Show, I seemed to come home with the equivalent of Boardwalk and Park Place. And over time, I came to believe that the treasures I received were meant for me. On the other hand, when I missed something terrific, it never bothered me. I just assumed that destiny had decreed that it was not meant to be. I have been known to remark that to acquire a collection like mine, one would have to be at every major flea market and show on the east coast for the past fifty years, and be able to run faster than me. That is, of course, quite true, even though, I was never good at running. I compensated for that by keeping going, Like Felix the Cat, I kept on walking, long after other collectors had gone home. 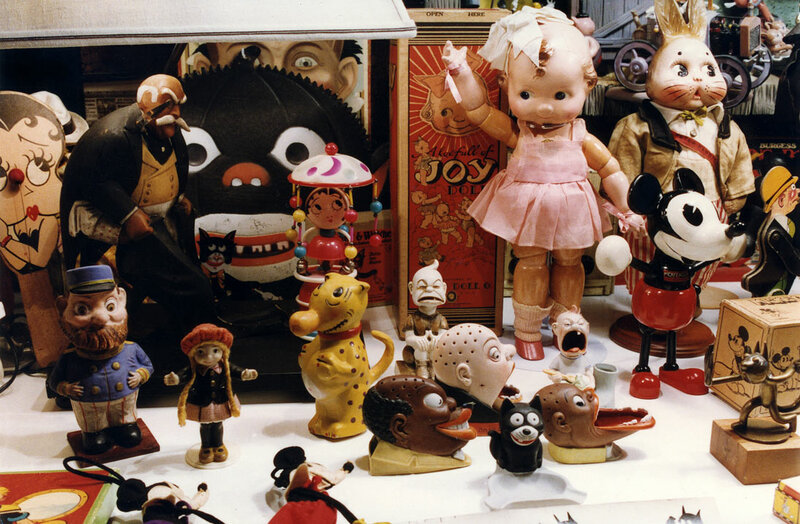 This photo must have been one of the International Toy Shows, perhaps in Philly. I see that there are several foreign items here. 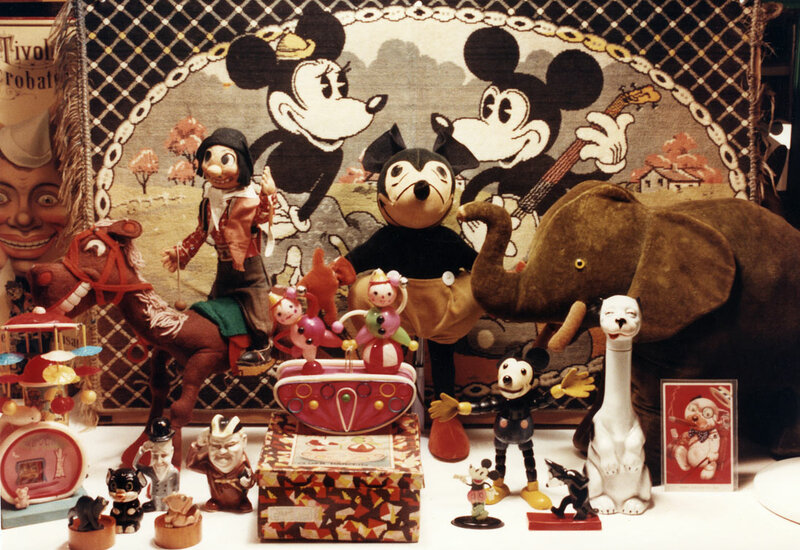 That spectacular large rug is clearly European, likewise, that impressively large velvet Mickey doll, of origin unknown. And I detect a relatively rare jointed wooden Mickey Mouse doll with blue pants, made by Deans Rag Book Company in England. God knows why I purchased that huge olive green elephant. Here too, are hand carved napkin rings of Bonzo and Ooloo, as well as a long necked decanter that depicts a drunken Bonzo. This clearly was a haul from Brimfield, I remember the day. There are some amazing treasures here, mixed in with friendly folk art. Right in the middle, is the first set of bisque nodders, circa 1928, mint, in their original presentation box. 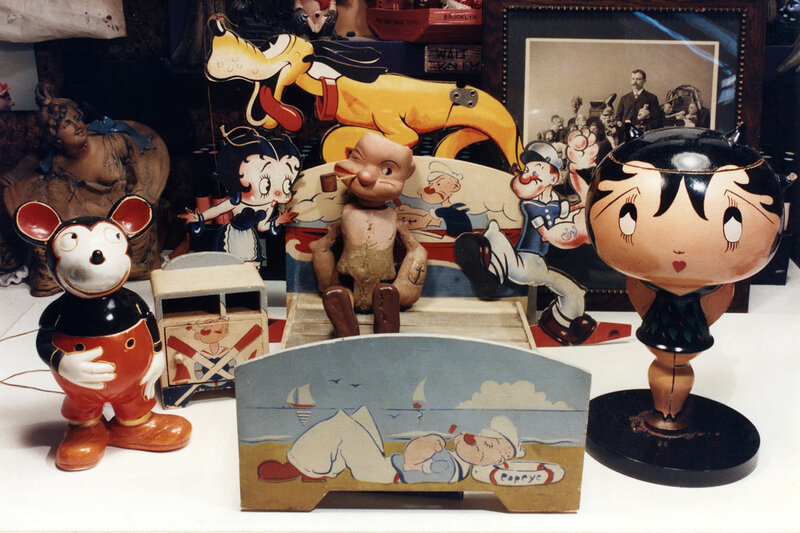 There is also an early Lenci Mickey doll, and a wind up Felix “Gee Dancer.” Here too, Is a deliciously big Popeye doll, and a one of Hans, a Katzenjammer kid. This was definitely Atlantic City. 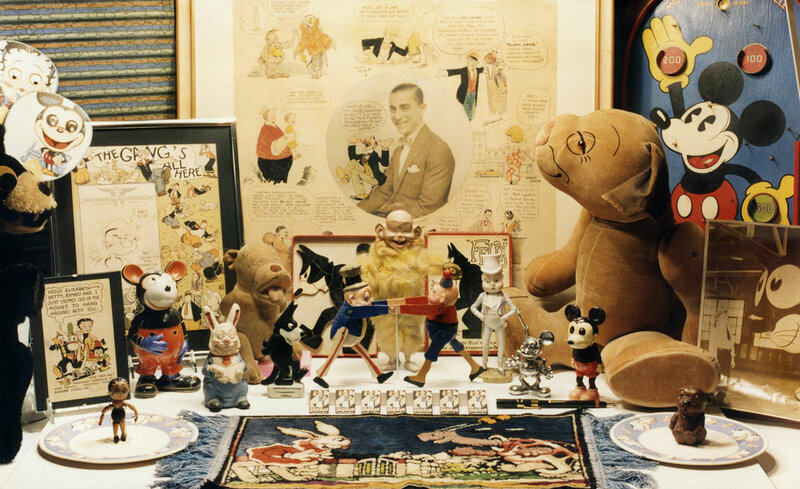 From a distance, we can see a spectacularly huge Bonzo doll by Deans, and a gorgeous piece of original and historically important comic art that includes vignettes by all the major comic artists that worked for the Chicago Herald Tribune in 1925. Beyond those items, this load requires a close up. Wow! What incredible stuff. Front and center, is a Foxy Grandpa candy container, by “Bunny,” in the image of a bunny! Behind him, is a pair of fighting Brownies, the only example known; and behind those, is an amazing doll of the yellow kid, covered in bright yellow feathers. 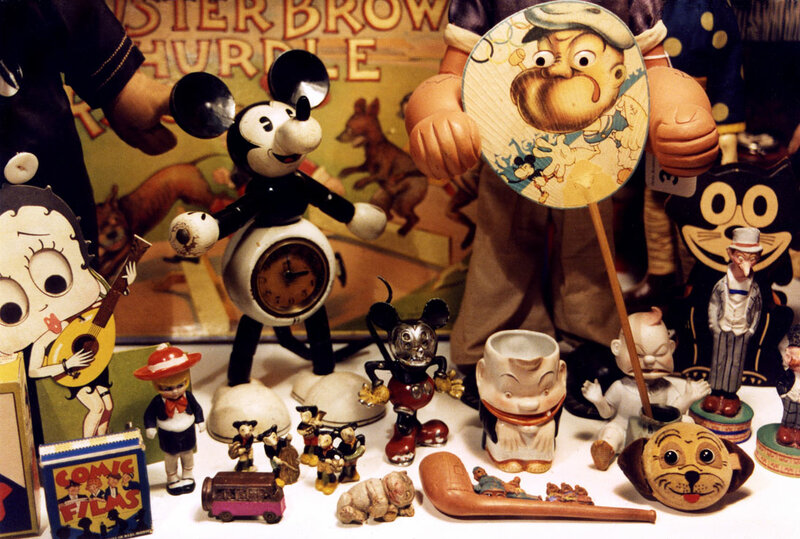 There is also a rare smaller Mickey radiator mascot, a German bisque of the Brownie Dude, some Spanish Popeye razor blades, a ceramic Mickey jar. a bisque Felix, and last of all, an ugly barfing Bonzo. Continuing to the right, we see the only known example of a Little Nemo flask, Buster Brown's dog, Tige as a candy container, and Foxy Grandpa, busting out of an egg. Behind them, is Ed Wynn as the Fire Chief, a Brownie candle holder, and the amazing book, All The Funny Folks, with its rare original dust jacket. Ah yes! I remember this. It represents a week at Brimfield. 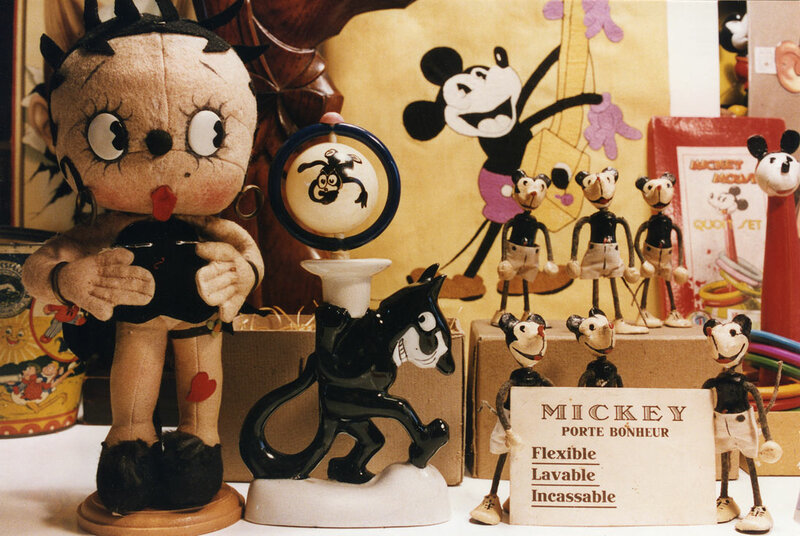 Some highlights are the tallest known example of an early style felt Mickey doll. 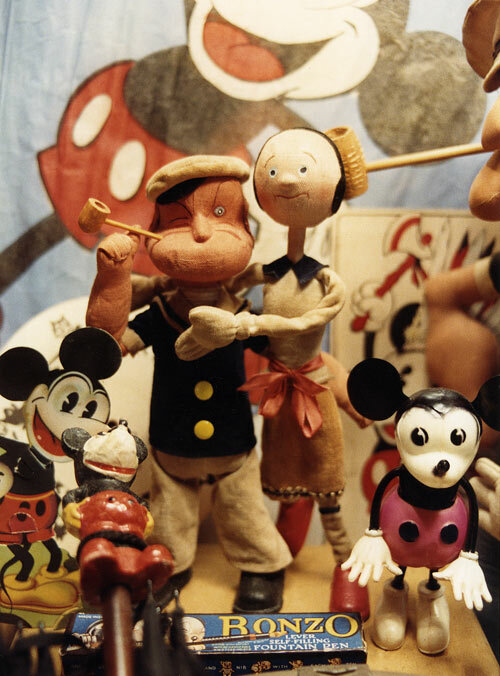 This series was made by Borgfeldt, and was as early as Mickey gets. No one had ever seen this larger size before, or since. There is also a wonderful figure of Buster, bouncing Tige, almost out of the picture, on the right side. But the item that makes this Brimfield memorable to me, is the fabulous Bonzo in the middle. A favorite dealer was holding him for me. When I bought him, the transaction caught the eye of a stranger, who was walking by. He went absolutely crazy, begging me to let him have my Bonzo. For the next three days he dogged my tracks, and hounded me to sell it. Obviously, if he knew me he, would have realized that he was barking up the wrong tree! this amazing betty Boop and Bimbo Spanish wine jug. The paint is all original. There is a mysterious trick to filling it, and the wine pours out of Bimbo’s snout! I found this while walking around the show. It was one of those occasions when fate was kind. 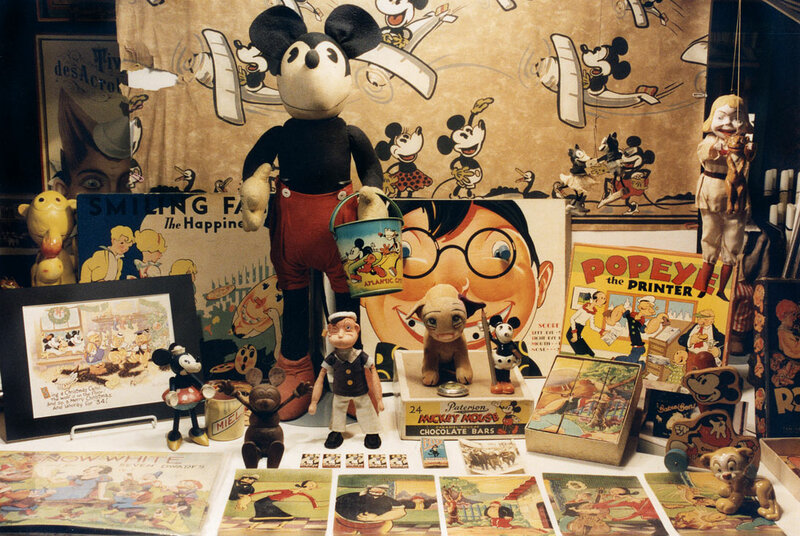 Visitors to Mouse Heaven have often asked me, How did you get all this stuff? Well these photographs should shed a some light on that. Apart from frequent shows and fleas, I was running adds, and making calls, purchasing many things through the mail, and bidding in auctions as well. My appetite for discovering major and minor masterpieces was all consuming. All the while, I experienced a feeling of quiet urgency, an uneasy belief that the amazing works of art I was collecting would be available for just a day, and then, forever go away. Time, and the mediocre stuff that appears on eBay, these days, has verified the veracity of that belief. And above all, I knew how to play the game. Dealers liked me, and enjoyed finding things to offer me. That was because I played fairly, and had an arsenal of friendly weaponry; foremost among these was Secrecy. I knew how to keep a secret. If a dealer showed me something, and by chance I didn’t buy it, I never breathed a word to anyone that I had seen it. Thus, dealers realized, over time, that they were not risking anything by showing me something privately. If, by chance, I didn’t buy it, the item would not have been what dealers refer to as, “shopped,” because I would keep my mouth shut. Gosh, I’m enjoying posting these images, reliving the experience of discovering so many amazing things. This photo represents an Atlantic City Show that was especially great. What fabulous stuff! I got that great big Popeye doll from Noel. It is mechanical, and walks almost by itself. 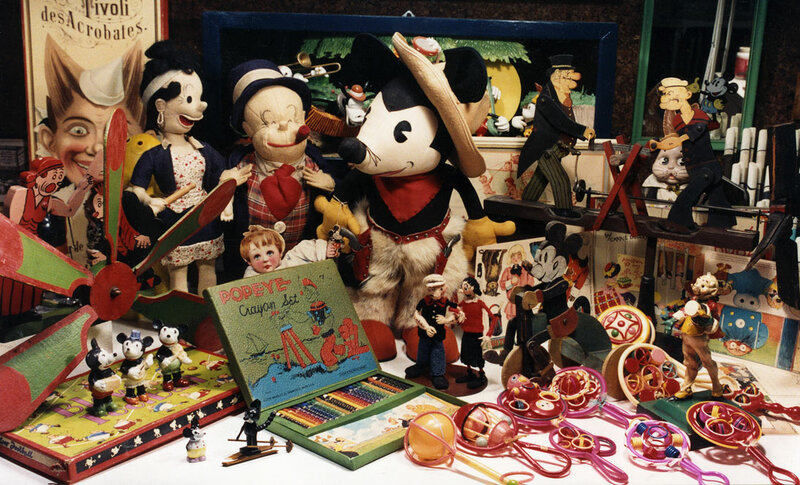 There is also a French Mickey Doll, and a delightful oilcloth Orphan Annie doll with a polka dotted fabric dress that is original. Moving in a little closer, we strike gold! 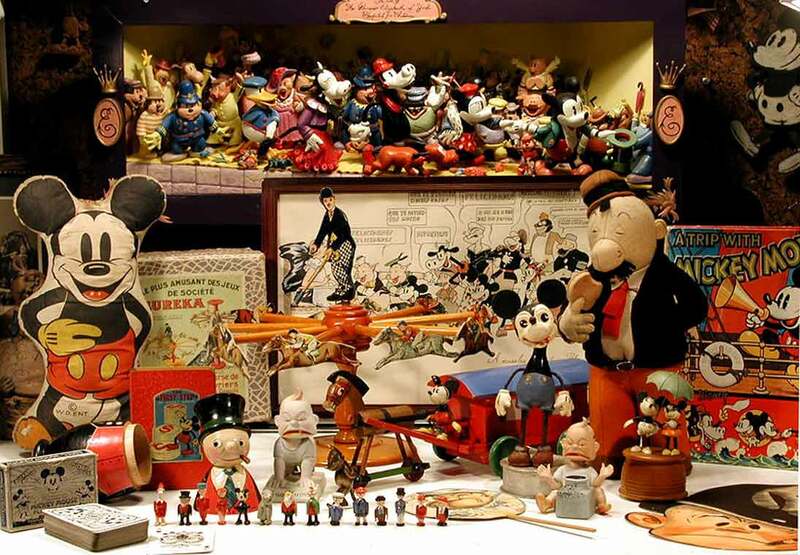 This load is full of treasures, but none greater than the fabulous wood jointed Mickey doll from Spain, with a clock in his belly. This has to be the ultimate Mickey Mouse timepiece. 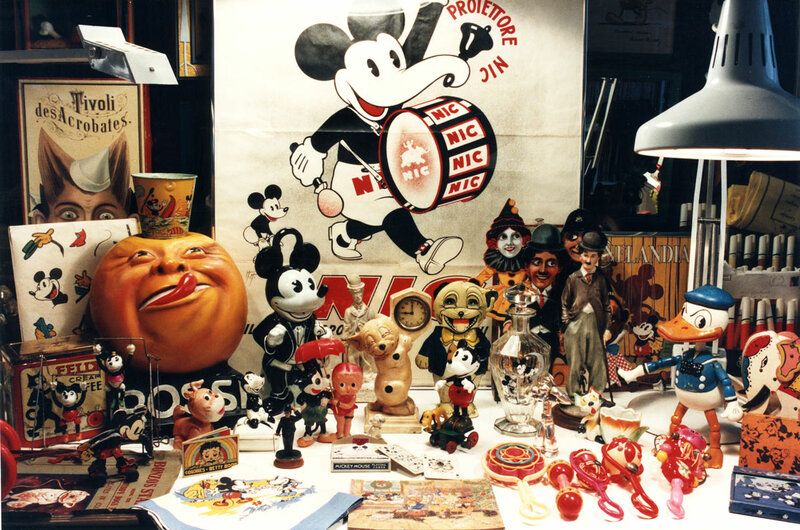 Here also, is a Desmo painted Mickey mascot in a smaller size, an ultra-rare Bonzo compact by Schuco, and a Happy Hooligan clay pipe. Can you find the sweet little wood carving of Bonzo, sleeping? This slightly blurry photo is from another Atlantic City Show. 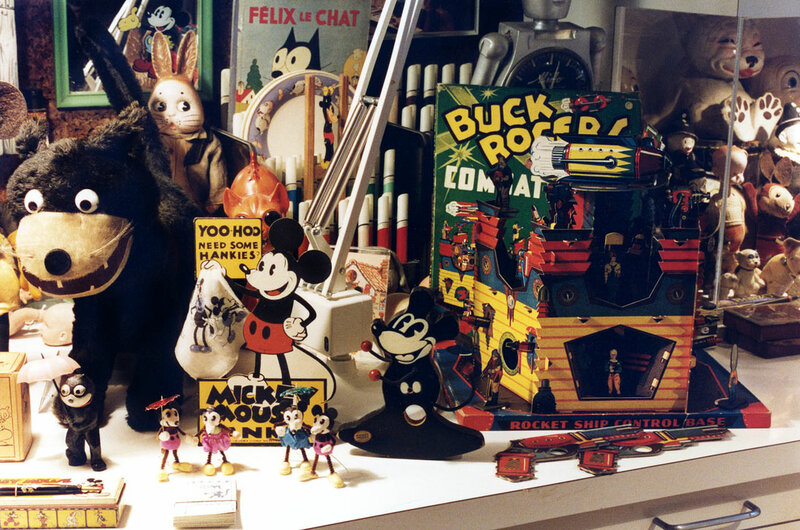 That large Mickey doll was actually made by Deans. This is the only one like it that has turned up, as far as I know. 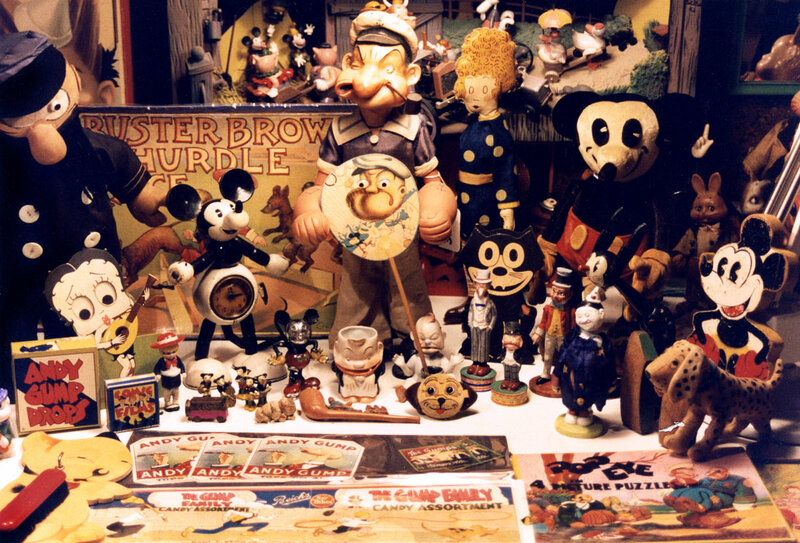 Many of the Yellow Kid items you see here, were purchased from my friend Rich Olson, a few days before the show. I included them in the photo. There is a sharper photograph below. 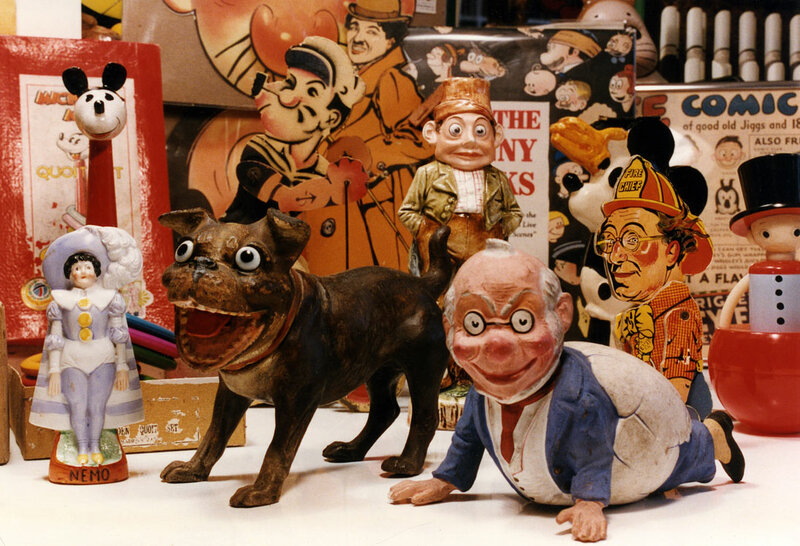 This closer shot shows a Felix windup automaton from England, a beautiful Buster Brown bronze statue, a pair of Flip the Frog bookends, also from England, Jiggs carved from a coconut, and a charming Punch and Judy show. This was another from Atlantic City, or maybe Kennedy. In the background, is a Mickey Mouse kite, as fragile as a butterfly. 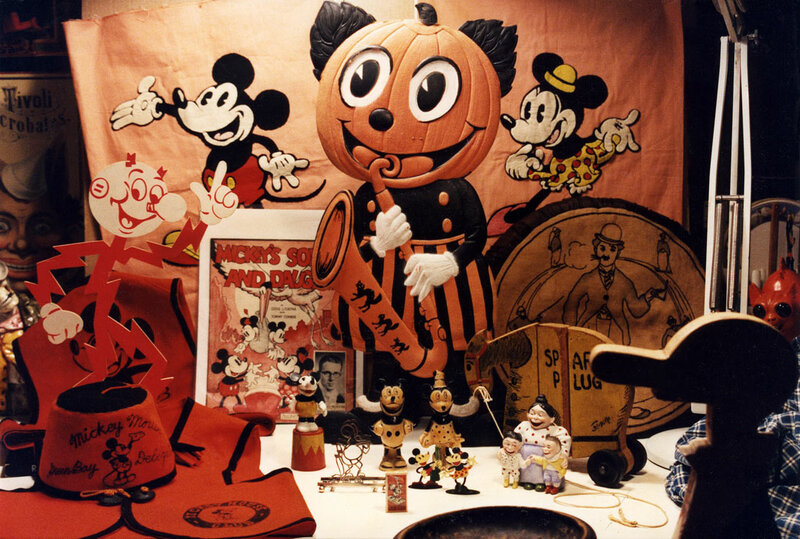 A giant sized German cutout Mickey pumpkin man, and a German celluloid Mickey windup toy, which is very early with five fingers. He is standing on his original box, although, it doesn’t show. On the left, is a mechanical Wrigley’s Spearman doll, and in the middle, an Italian lithographed lunch pail. There is also a pair of Lenci Mickey and Minnie dolls. My favorite items in this group is this charming pair of Popeye and Olive Oyl dolls. They were made in Japan by the Paris Novelty Company. This was the only time that I or anyone ever saw the Olive doll. It is rare to find Popeye items as unique as these. As I have some vertical space to fill here, I might say: Another weapon in my bag of tricks was “Honesty.” I never played the poker face game, my undisguised reaction was a dead giveaway that I loved the thing that a dealer was showing me. No doubt, the fact that I lit up like a Christmas tree, cost me money. But it also meant that dealers loved to please me. Hand in hand with that, was the fact that I never chewed down a price. If the object being offered was worth the asking price to me, I never played that boring game so many collectors indulged in, automatically asking, Can you do any better? If the price was right, I bought it. And if the price was out of line, I explained why I felt that way. Sometimes, a dealer would see the light, and sell it to me for less. If not, I politely passed the item by, and there were no hard feelings on either side. So, it was no wonder that, sooner or later, most of the major dealers got into the habit of saving their best stuff for me. And, as most of the time, I made sure to see them well before the show began, often as early as the day before. They lost nothing by showing items to me first. Of course, there was a price to pay for this luxury, but it was well worth it to me. I’m not sure what this photo represents. Perhaps, the Philly Toy Show. The Popeye doll and furniture are definitely Spanish. The Chad Valley Pluto is from England, and that fabulous Betty Boop wooden container is from Italy. It’s incredibly impressive, in person. Here’s a rather nice one. 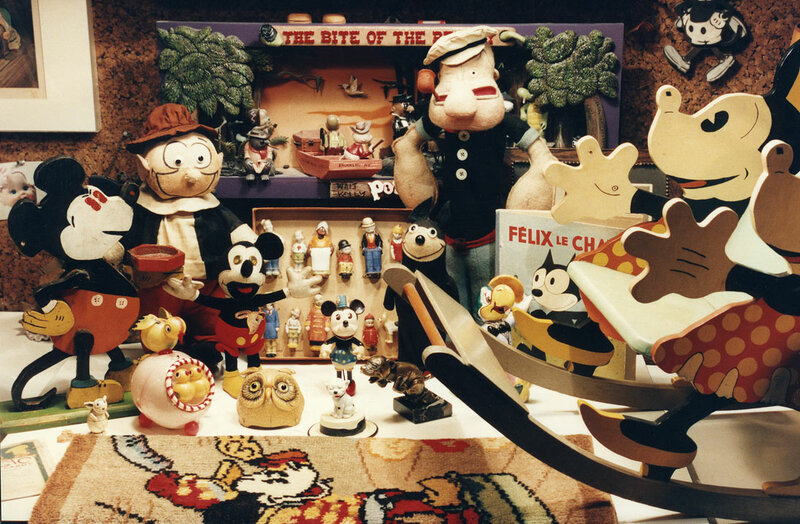 It features a really giant Mickey Pumpkin man, and on the left side, are the original fez and vest that were worn by the members of the 1030s Mickey Mouse Club. There’s also a rare bisque of Mama Katzenjammer and the Kids. This was one of the most wonderful Atlantic City Shows. I got both a Felix and a Mickey mask, and a cornucopia of treasures. Alas the yellow kid Figures went back to the seller, when I realized that he had constructed them himself with brand new crepe paper. The parts that were real were really not enough to rationalize the price. 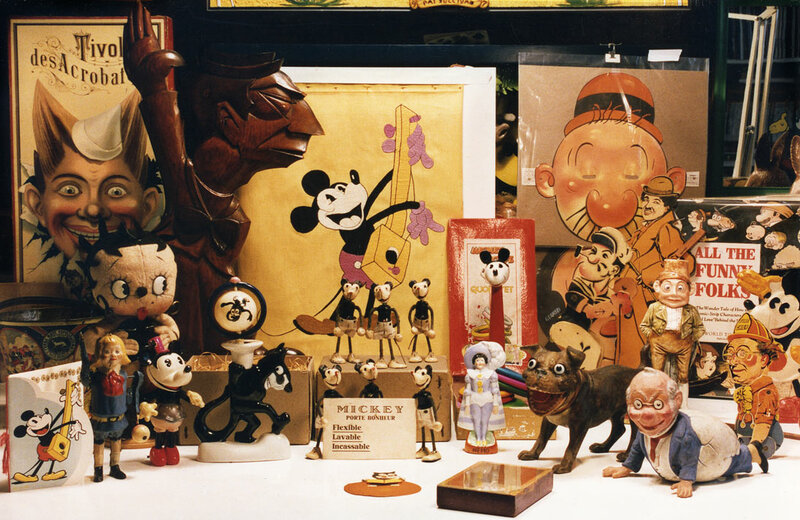 The other things here, are amazing, a Deans Rag Book Mickey marionette, an elegant Charlie Chaplin windup, a litter of Felix kitties, including one with rhinestone eyes, and a boxful of German “crackers” to celebrate New Year’s Eve 1930. 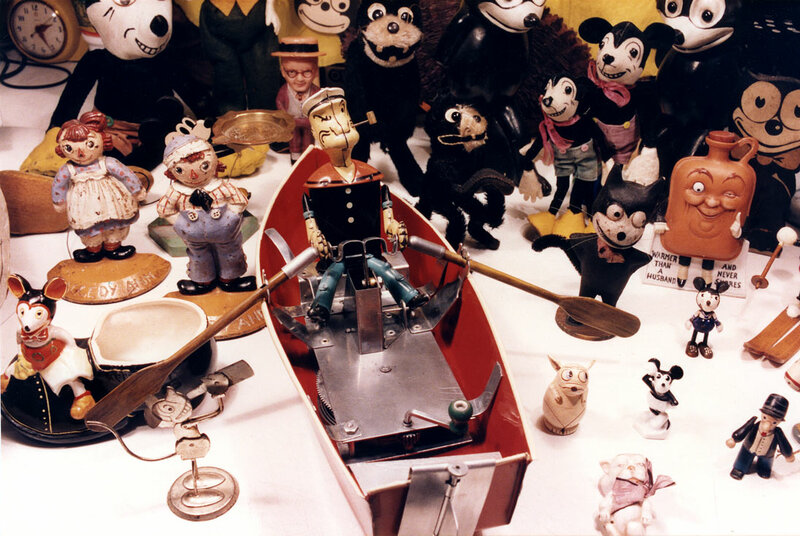 Most Importantly, this was the year I finally found a perfect Popeye rowboat. I originally had the first one that anyone had seen. It cost me fifteen dollars in NYC. It was a wreck and incomplete, but way back then, it was considered as rare as hen’s teeth. Throughout the years, I searched for one that was perfect and complete. Now, here it was, the best example I had ever seen. It had the rudder and the oars, the pipe as well, and everything was pristine. I remember this stuff. I got it all at Brimfield. The most unique object here is a perfect Scrappy doll, the only one that’s ever turned up. I also like the Andy Gump pipe cleaner holder. The pipe cleaners form his arms. Here too, is a celluloid Donald Duck. This represents another week at Brimfield. 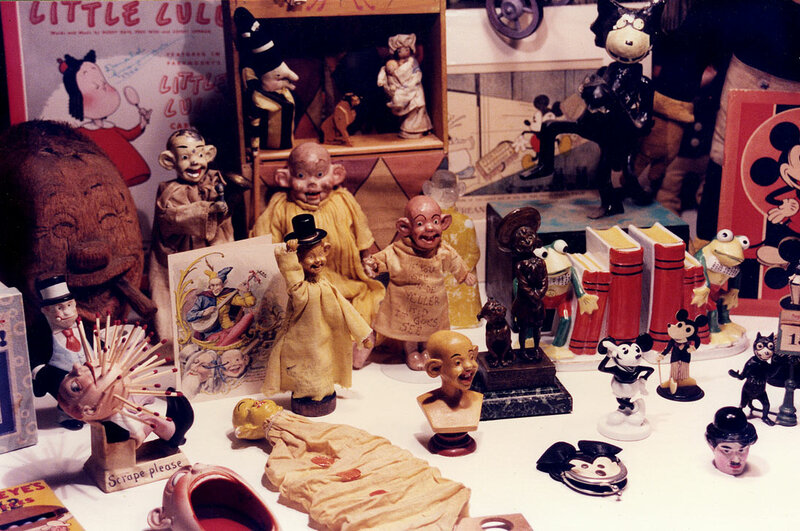 The most extraordinary objects here are that unique Flip the Frog doll, and an exquisite bisque of Moon Mullins and Kayo. In the background, is a rare Oz book, written and illustrated by Denslow. This was a great week at Brimfield. I got the Deans Rag Book Jeep from the same lady who sold me the Bonzo doll previously. I see he’s standing on a Jeep Big Little Book; I’ll have to look around the house for that. I got the pair of Lenci Mickey and Minnie dolls, dressed as a cowboy and an Indian, from the late great Richard Wright. 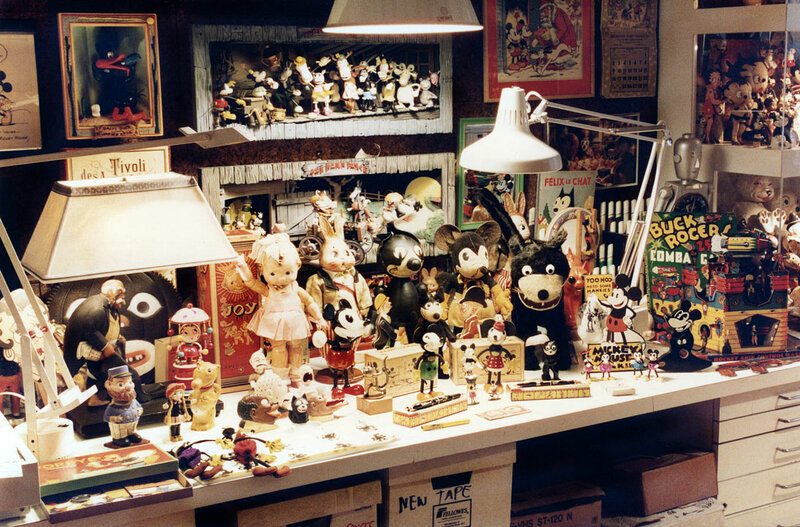 He also sold me the set of Mickey Minnie and Pluto Lenci dolls. I notice the very early Comic Ladder with the tumbling figures of Hans and Fritz intact. This is one of the earliest comic toys. It dates from the Turn of the last Century. I liked this load so much I took another shot. 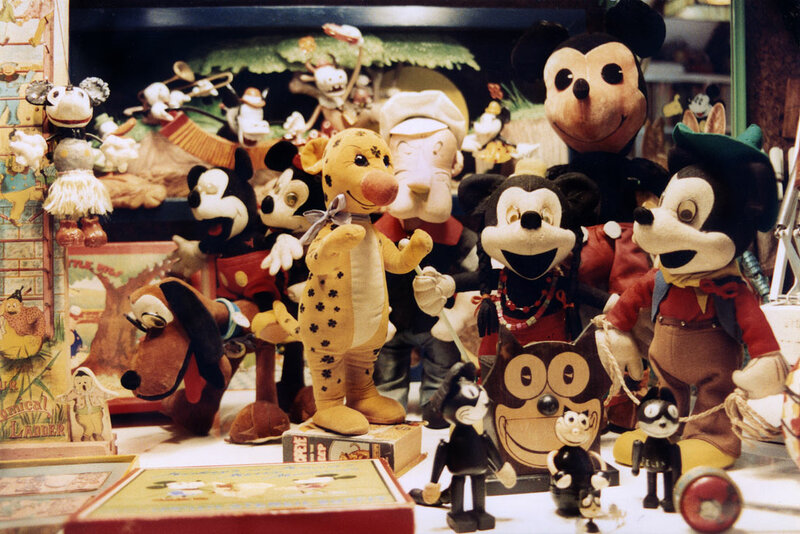 The tall Mickey doll in the background is Spanish. And the Felix face in front is a cigarette dispenser. A Mickey hula dancer hangs from the ladder. The treasure trove, below, represents a wonderful week at Brimfield. 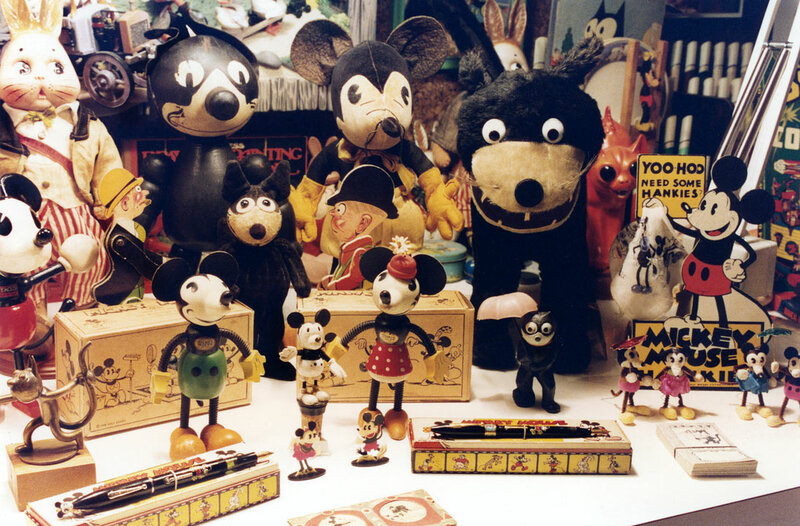 The enormous Mickey cowboy doll in the middle is totally complete and, by far, the best I've ever seen. Behind him is a set of Jiggs and Maggie dolls that were too pristine to pass up. Maggie even has her rolling pin and jewelry. That fancy set of Popeye crayons is mint and complete. But when all is said and done, I think the thing that I like best is that fabulous folk art weathervane that depicts Popeye and Major Hoople, sawing wood. The bounty from this next Atlantic City Show was quite incredible. This panoramic photo dosen’t do it justice. No wonder I moved closer. Even my jaw is dropping at the sight of these! Starting from left to right, we see a Betty Boop noisemaker, and a handsome Esquire-like gentleman putting on his pants. This charming wood carving has been made into a lamp. 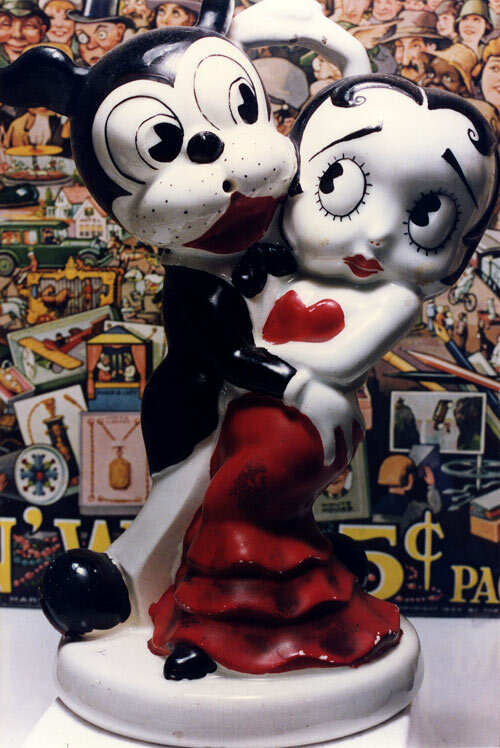 A geometric celluloid of Betty Boop follows that. In front of her, is a rubber Jeep, a bisque of Annie Rooney with carefully braided hair, a nodding figure of Der Captain Katzenjammer, and a group of three interesting Schaffer Vater match holders. 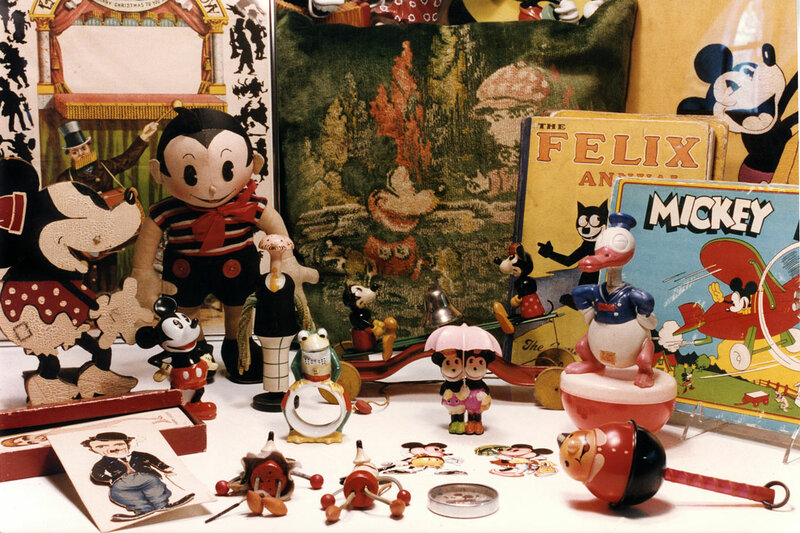 Then, there is a perfect jointed doll of “Joy” by my favorite toymaker, Joseph Kallus, a perfect early Borgfeldt Mickey, and behind him, an early Harrison Cady Peter Rabbit doll. 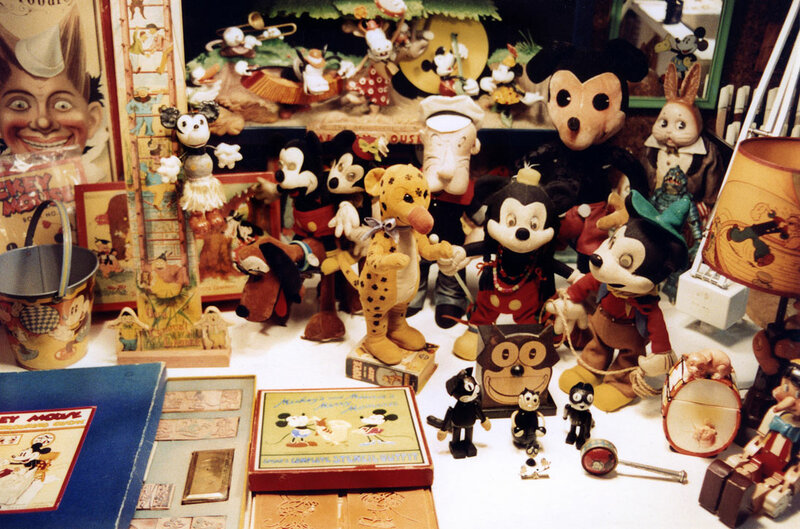 Continuing, we see a pair of Mickey Mouse pen and pencils in their colorful presentation boxes, along with a pair of the earliest Mickey and Minnie dolls. They have their rare original boxes as well. 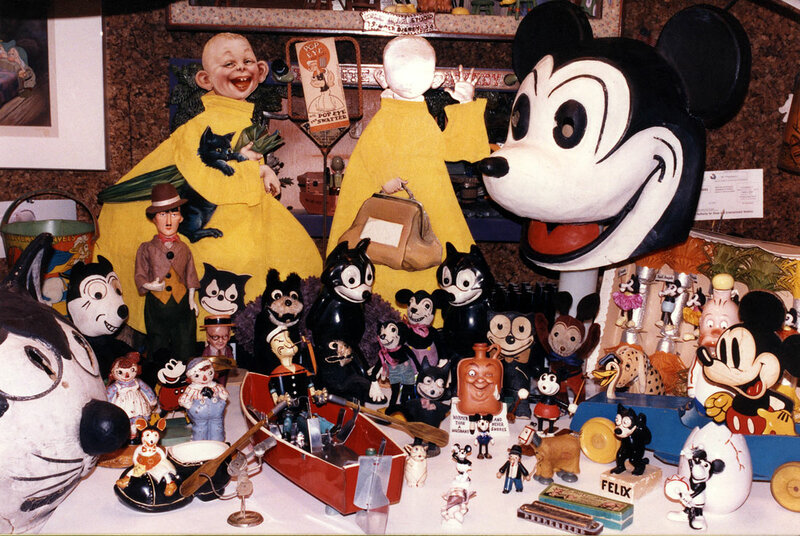 Then, there is a huge wood jointed Felix from Germany or Italy, a charming Mickey doll, along with one of the earliest Felix dolls. Next, is an extraordinary large Felix doll, the only one I’ve ever seen standing on all fours. 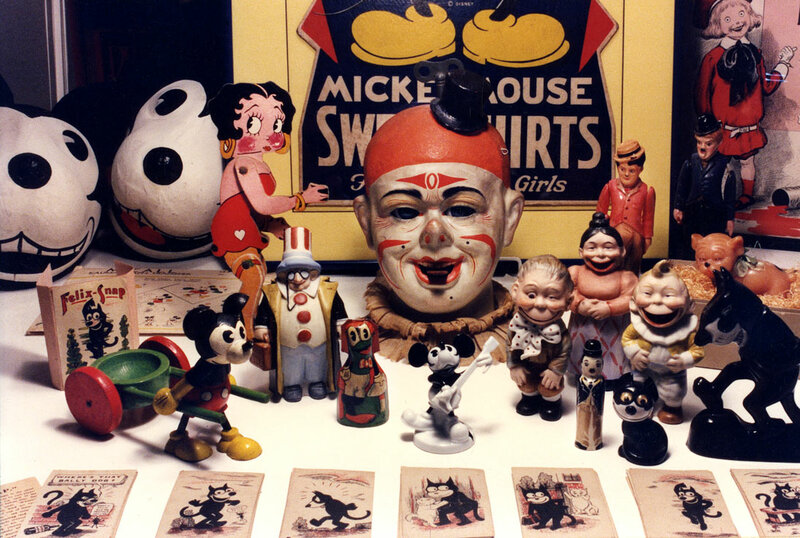 Peeking over his shoulder is a fascinating perfume lamp of a scary looking red pussycat, and last of all, a Mickey Mouse hanky display. And, finally, we come to the Buck Rogers Combat Game, one of the rarest Buck Rogers items of all time. This awesome set was manufactured by Built Rite, the only licensed product they ever made. It’s all complete, right down to the original rubber bands. Last, but not least, and a fitting way to end the page, is this mind boggling Celluloid Mickey that I got on this occasion, from John Haley. The photo below shows it actual size in the modest cardboard box, in which he handed it to me. I left it in that box for weeks, reliving the moment I first saw it. 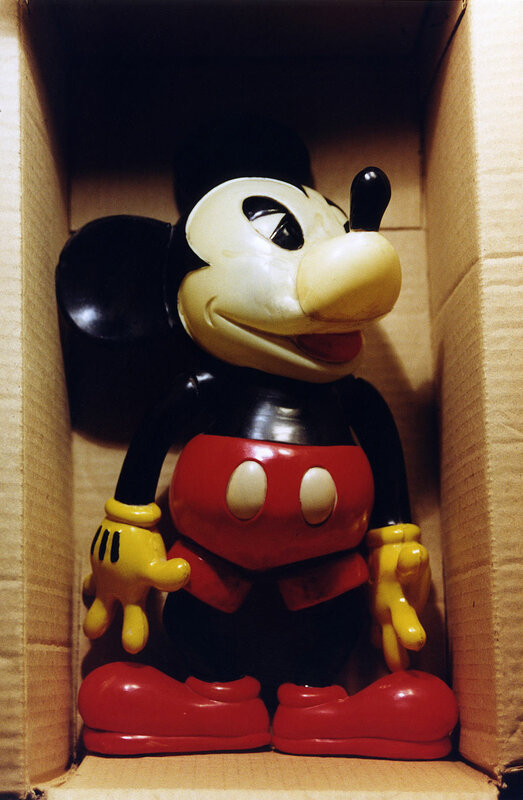 After so many years of collecting Mickey, to open that inconspicuous carton that was so light it felt empty, was a stunning revelation to me. At that moment in time, this had to be the most amazing celluloid toy I’d ever seen. And I still feel that way today. I'd never imagined that such a thing existed, even in my wildest dreams. Well, that’s all folks, at least, for today. It’s been a lot of fun for me putting together this unexpected page, and reliving fond memories of many glorious days. I hope you too enjoyed this secret insight into what it was really like, back then, collecting Comic Characters, in the Golden Age. This page might never end. I just found another photo on my old computer that represents another week at the Atlantic City Show. My intuition told me that it wasn’t included here. My memory for these things sometimes surprises even me. Anyway, there are some treasures here worth including. 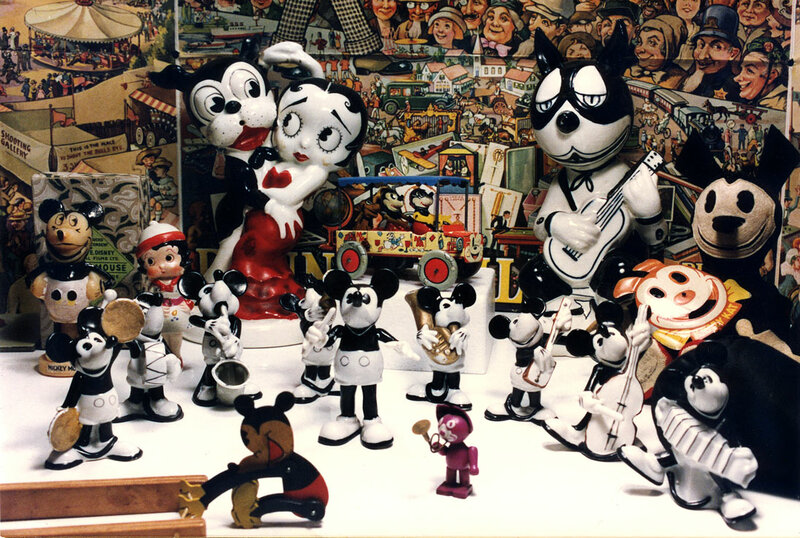 One favorite is a wooden Jiggs, made in Italy that opens to reveal a group of thin wooden comic characters. From here, I can make out Jiggs, Maggie, Felix, and Happy Hooligan. There is also a wood carving of Mickey riding on a horse drawn gypsy caravan, also made in Italy. 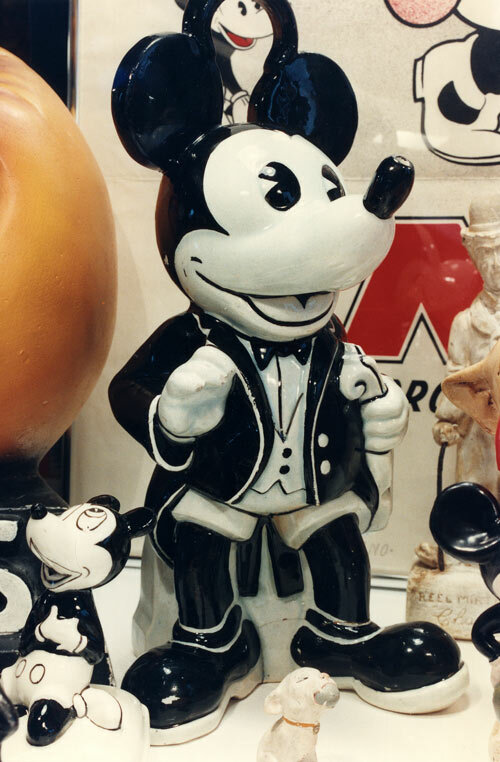 I really like a German nodding toy of Mickey standing on a candy container, a lovely pair of wooded Mickey and Minnie, under an umbrella and a Mickey savings bank that’s rather rare. 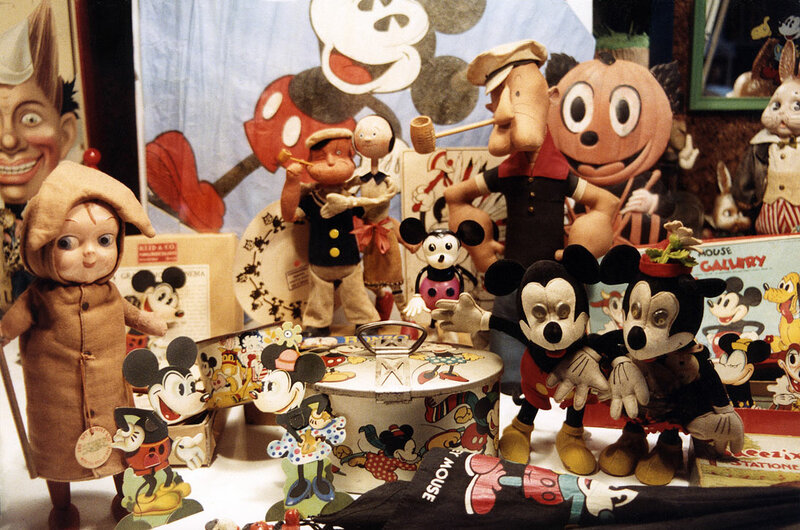 Here too is an early oilcloth doll of Mickey and a felt doll of Wimpy, that I learned recently was made by Lenci. In the background, is a lovely Spanish drawing, celebrating a young lady’s sixteenth birthday. This represents another Atlantic City Show. 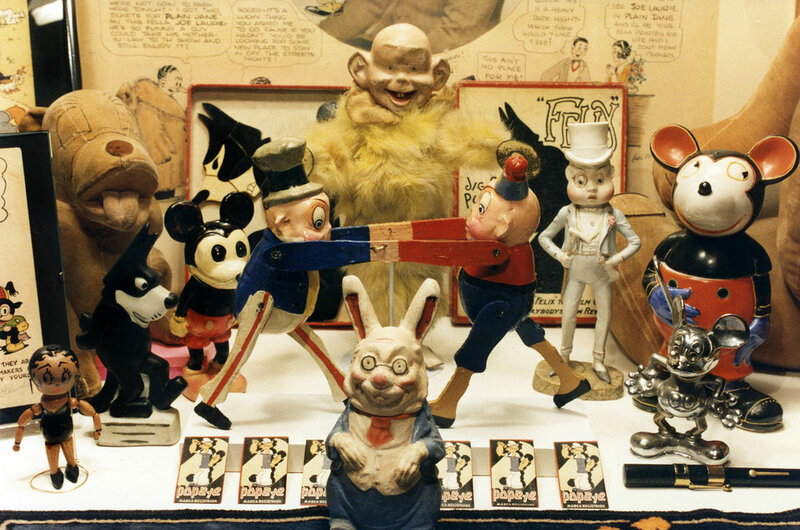 The highlight of this load is the fantastic clown automaton in the middle. It is one of those treasures, outside of my category that was too good to pass up. In the same group, is a rare bisque of Dr. Pill from Little Nemo. His paint is all original. 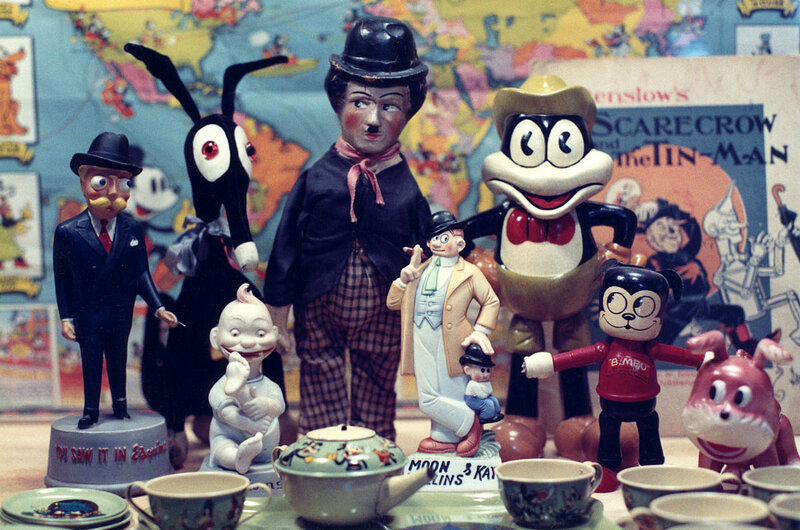 Here too, are some bisques of Hans and Fritz, along with Mama Katzenjammer, an evil looking walking Felix, a Mickey Rosenthal, a Flip the Frog clicker, a curious pair of Mickey masks, a jointed cardboard Betty Boop, a Chaplin perfume bottle, and a wooden Mickey, made in Italy.